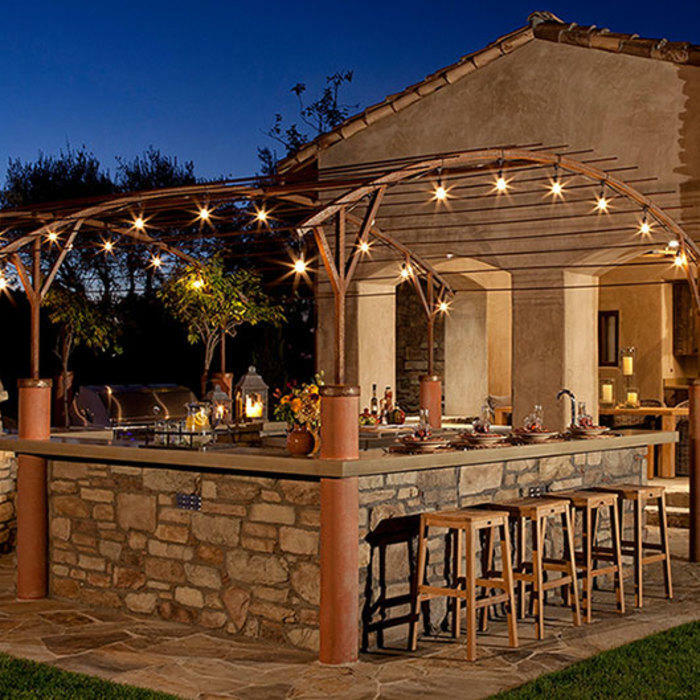 Outdoor kitchen and dining areas are great for entertaining family and friends on a beautiful evening. These 7 ideas will inspire you to dine in the outdoors. #1 Have a clear budget. Building a DIY outdoor kitchen can cost anywhere from $1,300 to $10,000. You can start as small as a a grill with a counter outside to as grandiose as a pergola, complete with a counter, sink, refrigerator and bar area. 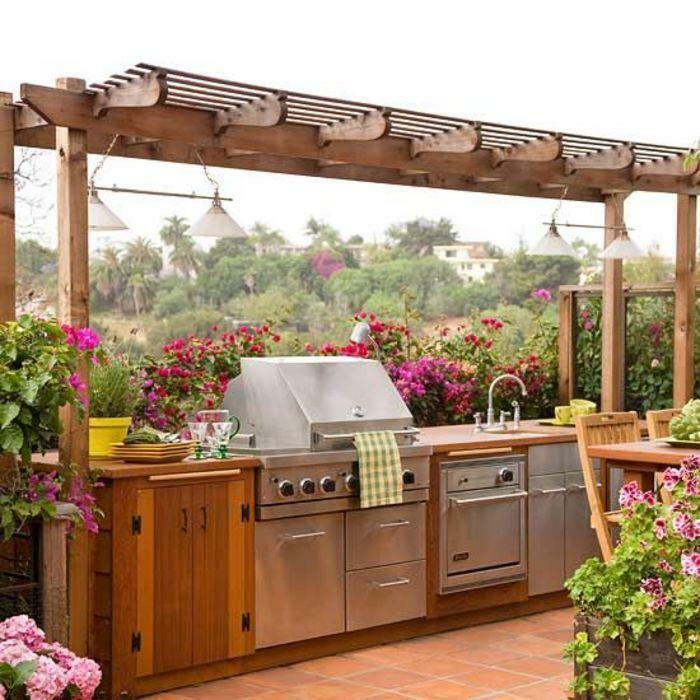 It just boils down to what outdoor kitchen ideas suit your needs and budget. 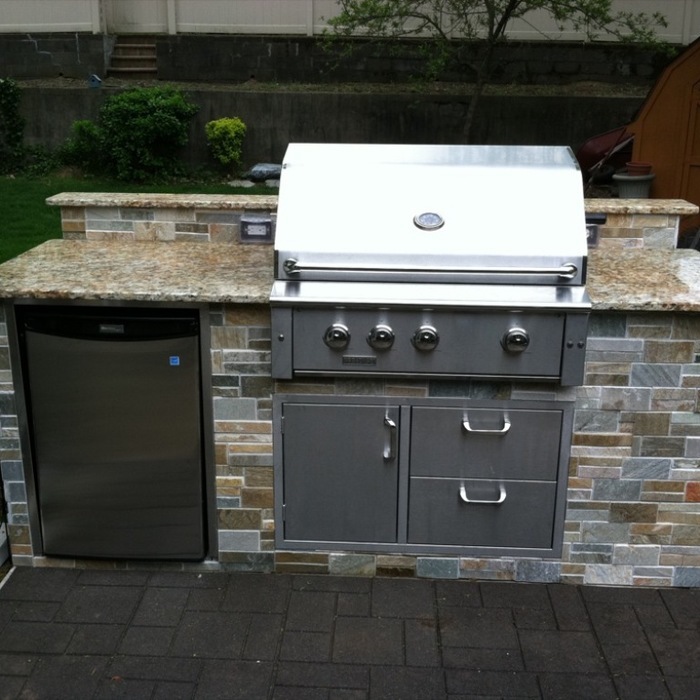 Look at your financial situation and consider not only the budget of the build but also the money needed for maintenance of your new outdoor kitchen. Outdoor kitchens need to withstand your area’s weather conditions -- thunderstorms, snow, hail, high winds, and more -- so make sure you choose the right materials. You don’t want to spend thousands of dollars on annual repairs. 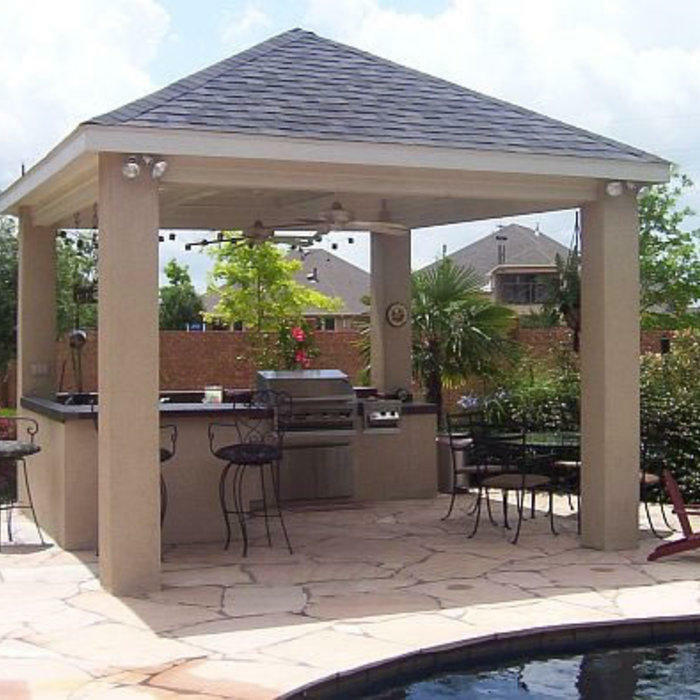 If you live in a rainier area, a more permanent roof like this one will keep your gatherings and outdoor experience more pleasant for you and your guests. A full coverage roof will also protect your furniture from the elements better than a canopy or pergola, depending on the typical climate. #3 Make it a full-service kitchen. If you want an outdoor kitchen beyond just a grill, you’ll need plumbing pipes and electrical wires for the sink and stove to complete your full service kitchen. This means you’ll have to dig up your yard and part of your house to run the lines out, which will cost extra. Plan your budget accordingly. You can make a smaller cooking area feel like an indoor kitchen with a wall sconce; it will also help to hide your wiring and plumbing. #4 Shed some light on the situation. Don’t rely on natural sunlight alone for your space. 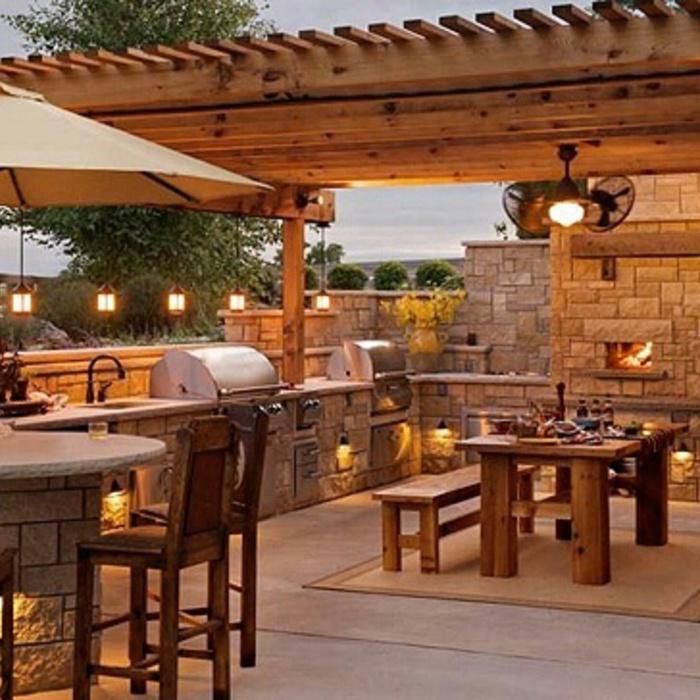 How's this for an outdoor kitchen idea? Add overhead lighting -- recessed cans, pendant lamps, etc. -- to light your space at night. You can also increase airflow by adding a ceiling fan with a lamp. 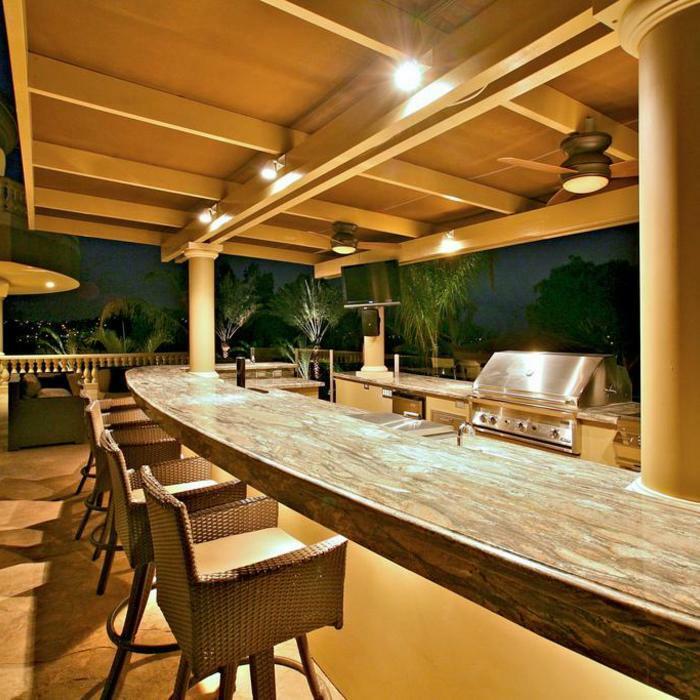 This lavish patio from Anaheim uses track lighting to highlight all of its features. Outdoor kitchens should be usable, regardless of how hot the summer gets. Draperies, curtains and other shade treatments can block the sun before it goes down. If you want a more lasting approach, add a pergola overhead to maintain some natural light without sacrificing shade completely. If you don’t have the space or budget for a large, full-service outdoor kitchen, you can do a small outdoor kitchenette and still achieve your goal! 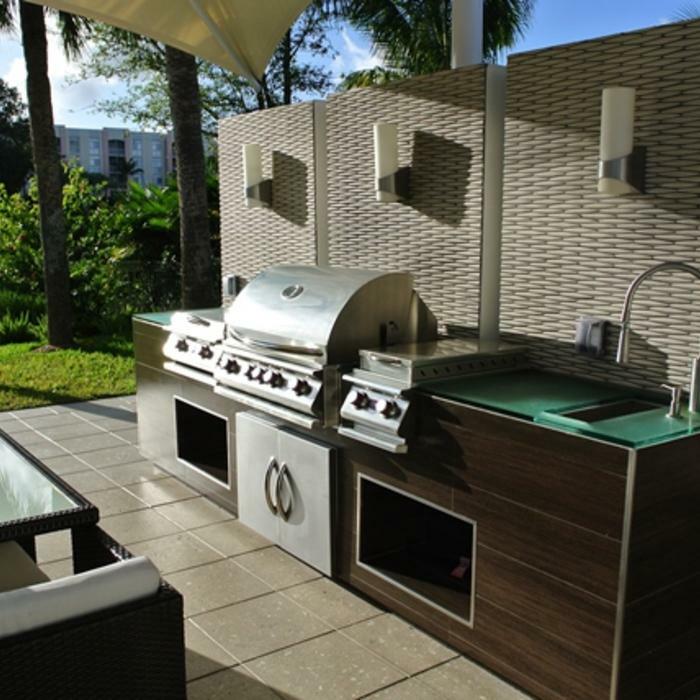 This combination grill and mini-fridge allows for entertaining on a smaller scale. #7 Don’t forget the details. Make sure the area surrounding your outdoor kitchen is just as homey as your indoor kitchen area. Use furniture, an entertainment system or fireplace to make you feel more comfortable as you prepare and enjoy a meal.